Dutch weather forecasters have an interesting job. It is sometimes claimed that when it comes to the weather the Netherlands has four seasons a day. On some days, you’ll readily believe it. Brilliant, isn’t it? Not only does the wording leave them a lot of wiggle room, but it’s actually correct, say, 75 percent of the time. Sure you could say ‘scattered showers’ instead, but that doesn’t sound quite as poetic. A tad lazy, perhaps. You’re looking west across the river IJ, which happens to be our backyard. The tug is a Port of Amsterdam pilot ship. Amsterdam is a busy port, which extends from here — close to the city’s center — all the way to the North Sea. 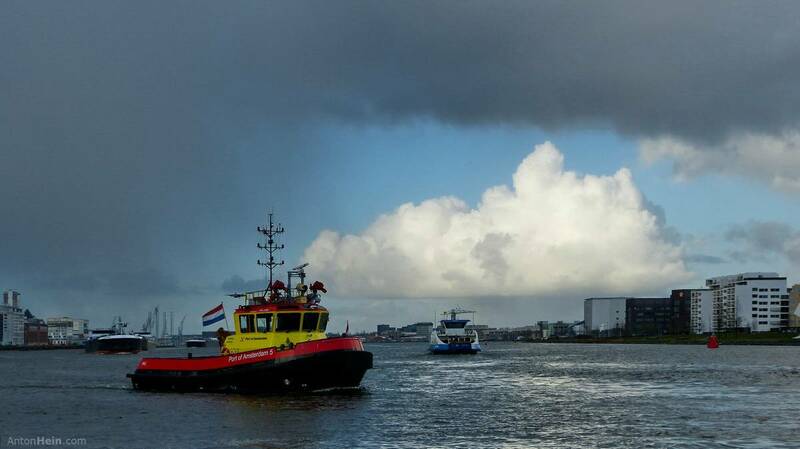 One of the free ferries is on its way to what the New York Times recently correctly identified as one of Amsterdam’s hotspots — the former NDSM wharf. Once the largest wharf in the world, in the late 1980s it became obsolete in part because bigger yards had opened up in the Far East. A few years later the city leaders made a deal with squatters and artists types who had started to use the abandoned yard, turning NDSM into an ‘artistic breeding ground’ where artists young and old, beginning or established could inspire each other to create bigger and/or better works of art. Look at the sky. That’s what ‘here and there, now and then’ rainy weather looks like. Still on the river IJ, which is normally quite a bit busier than this. 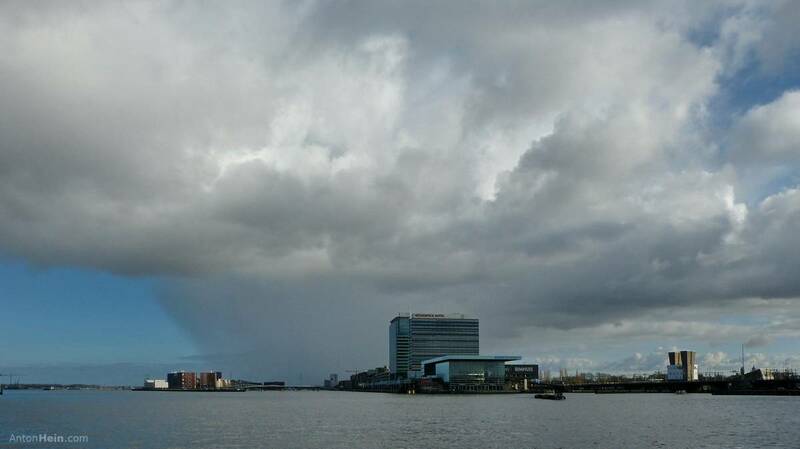 The tall building is the Mövenpick hotel, next to the Passenger Terminal Amsterdam, which welcomes cruise ships throughout the year. In front, the Muziekgebouw aan ‘t IJ (Music building at the IJ), a concert hall for modern classical music. Next to it is the Bimhuis, the Netherlands’ main stage for jazz and improvised music. The towers to the right serve as air ducts for the IJ-tunnel which connects Amsterdam-North. We both love bright and sunny weather. But I also very much enjoy days like this.